TheBlueGuerilla: UKIP South East Candidate In Middle Finger Salute. UKIP South East Candidate In Middle Finger Salute. 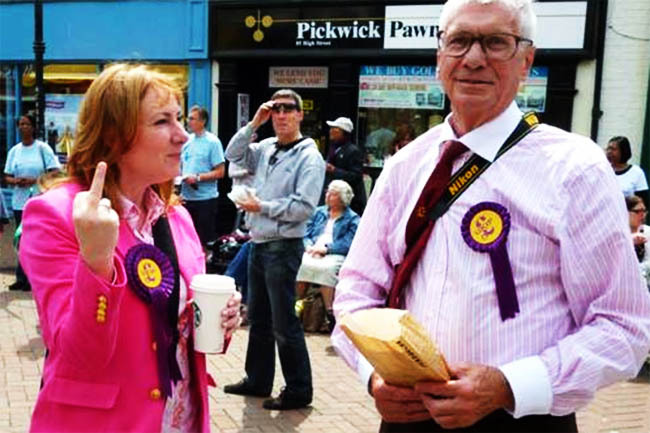 TBG can today confirm that UKIP South East Candidate Janice Atkinson, seen here sticking up her middle finger up to protesters at a rally at Ashford in Kent, is in hot water. Nigel Farage's number two, who has appeared on BBC's Question Time and is UKIP's National PR Officer, was caught just days after calling for protesters who hurled abuse at her and Nigel in Margate recently to be arrested. TBG understands a complaint has made to the Kent Constabulary about Janice Atkinson's outburst too. South East Conservatives candidates including Richard Robinson have roundly condemned the outburst as unprofessional and local MP Damian Green is also said to be concerned. Ashford People’s Assembly member Maria Pizzey posted the photograph of Mrs Atkinson on Facebook. Pizzey said - "She told us to f**k off because we stood peacefully holding placards accusing UKIP of racist policies,’ Ms Pizzey said in her post. "She made personal comments about my body size and when I told her I would quote her widely she said 'I don't care where you f**king post this, just f**k off!'."